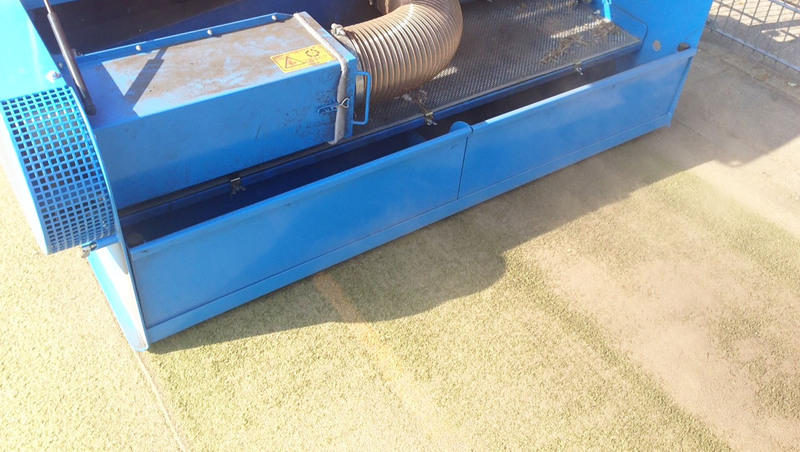 Maintenance of synthetic turf, playability and extracting particulates. These are several subjects that frequently pass under review, when it concerns the maintenance of different types of synthetic turf pitches. This is not surprising. A synthetic turf pitch consists of an intelligent system, where the suppliers and contractors adjust the technical characteristics of the pitch to wishes and demands from the sport associations and athletes in the best possible way. With hockey, the pitch characteristics will mainly respond to the ability of a ball to roll and the grip that the athletes experience. Moreover, with football a requirement will be that a sliding tackle must have minimal impact on the fitness of a team. The Quick-Clean has been developed with 4 requirements in our minds: the quality of the operation after the cleaning, high operating speed, reliability and the price of these requirements must be competitive with the market. Since we are contractors ourselves, as well as being developers of machines, we think that the last three requirements are as important as the first one. 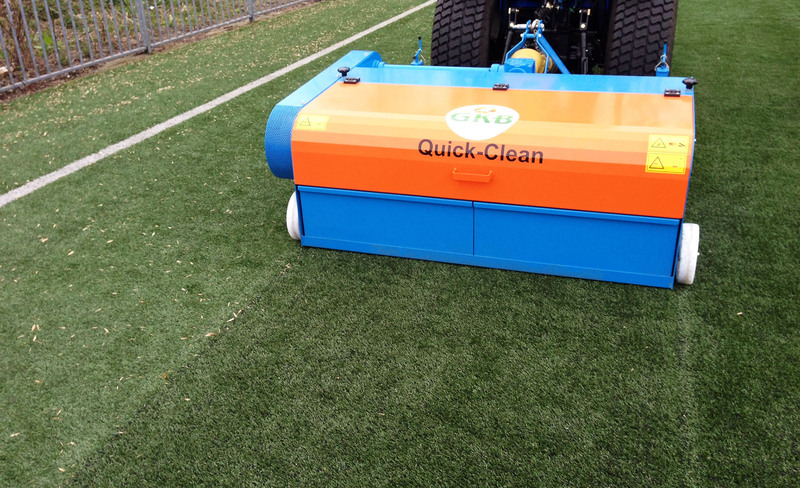 Our synthetic turf cleaner has a straightforward and simple operational principle. Within two minutes the machine is hitched and you can start your operation. Because of the high operating speed (max. 5 km/h) you can finish your operation quickly and effectively. The cleaner operates as follows. 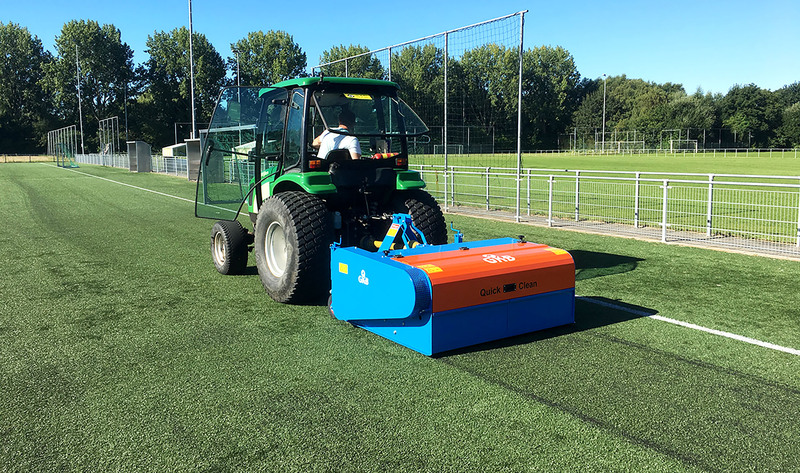 The synthetic turf brush will brush the infill material with all the contamination that it is containing and will cast it on a vibrating screen. The coarse dirt will be moved to the collection container, dust and other light-weight dirt will be absorbed by a suction unit with a dust bag. The content of the collection container can be emptied in a regular waste container, the full dust bag can be disposed and replaced. You can install the operating depth by means of turning in or out the two adjustable front wheels. 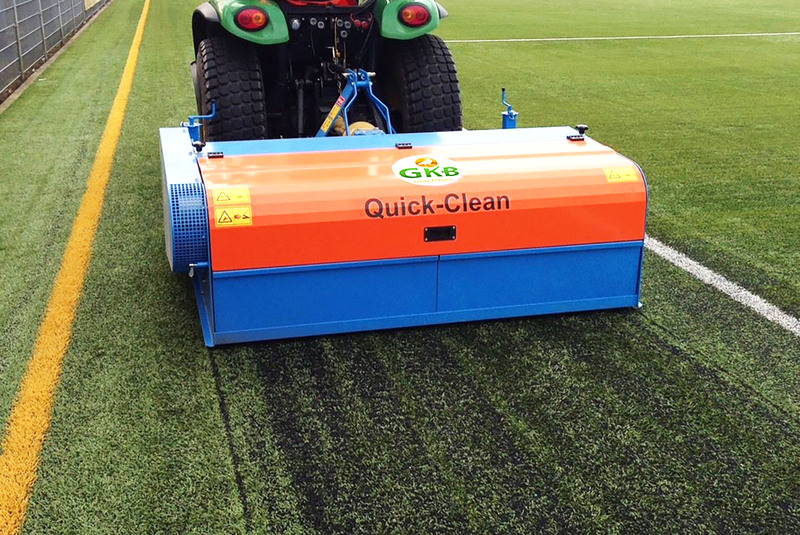 The rubber wheels ensure that the Quick-Clean will softly roll across the synthetic turf pitch. 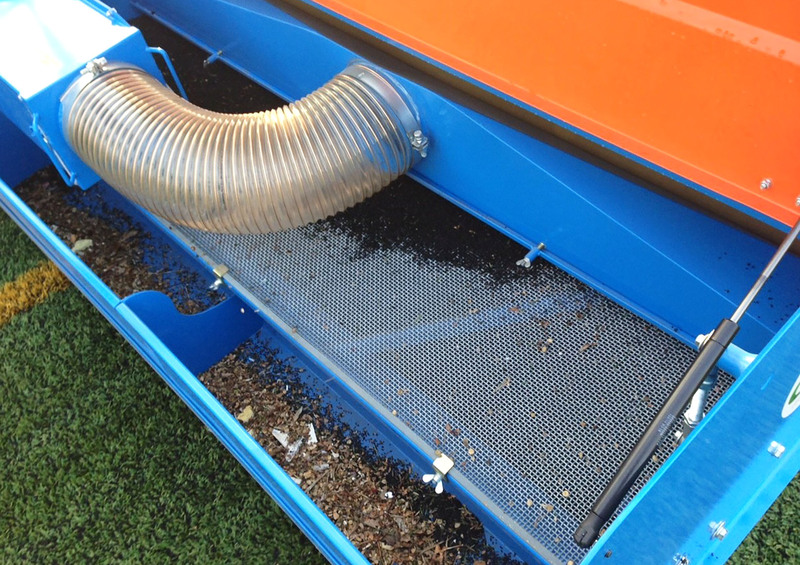 Depending on the cleaning of the pitch, you attach one of the three types of screens (rough to fine). These are easily changed on site with no additional tools. Since we very much support quality, the entire design and execution of the driving mechanism is robust. We know for a fact that you will be satisfied, as we are a contractor as well.